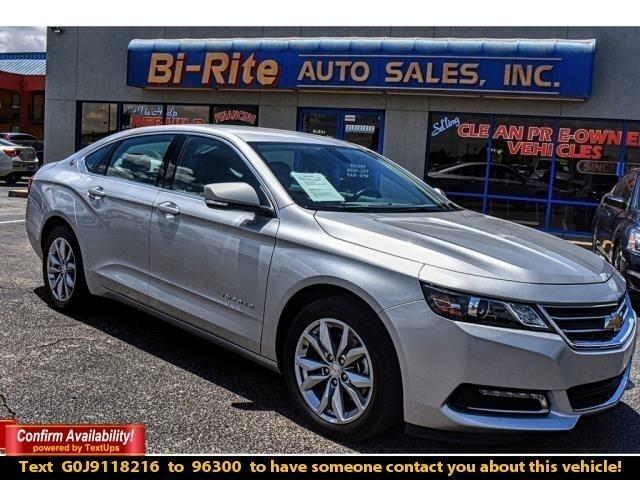 An excellent full-size sedan, our 2018 Chevrolet Impala LT Sedan is sleek in Silver Ice Metallic! Powered by a 3.6 Liter V6 that offers 305hp along with features stop/start technology while paired with a 6 Speed Automatic transmission for easy passing. Our Front Wheel Drive Sedan rewards you with aggressive performance and incredible efficiency of near 28mpg on the highway. Just sensational, the athletic stance of our Impala LT refuses to blend in with the crowd! Simply sensational, the athletic stance of our Impala LT refuses to blend in with the crowd and is accented by gorgeous alloy wheels. Examine our photos to see the interior is spacious and welcoming with remote vehicle start, upscale seating, cruise control, dual-zone automatic climate control, a leather-wrapped steering wheel, power accessories, a trip computer and smart storage spaces. It's easy to maintain a connection to your digital world with Chevrolet MyLink radio featuring a touch screen, voice-activated technology, Apple CarPlay compatibility, Bluetooth, OnStar with available WiFi, satellite radio capability, and more! Impala by Chevrolet has a sterling reputation for reliability and safety with its rearview camera, LED running lamps, antilock brakes, traction/stability control, and advanced airbags. With ample passenger and trunk space, a wealth of amenities, and award-winning performance, our Impala is the smart choice you'll love for years to come! Print this page and call us Now... We Know You Will Enjoy Your Test Drive Towards Ownership! Please call us for more information.